1998 Accurpress mdl. 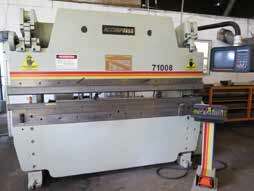 71008 100 Ton x 8’ CNC Press Brake s/n 4987 w/ Accurpress CNC Gauge System Controls, ETS Pendant Controller, 10 1/8” Throat. Accurshear mdl. 625010 ¼” x 10’ Power Shear s/n 3038 w/ Accurshear SC2 Back Gage Controls, 48” Squaring Arm, Front Supports, Angle Attachment. Gerber Sabre 408 CNC Router s/n 860.352 w/ Gerber Controls, T-Vac Option, High Frequency 24,000 RPM Spindle Option, 7.5” “Z” Travel, 54” x 100” Table. Esab “Silver Bullet” CNC Plasma Cutting System s/n 01337 w/ Lynx 84 Controls, ThermalArc PAK5 Plasma System, Torch Head, 9’ x 20’. 2004 BPR Eagle mdl. CP40H Roll Bender s/n 2004D078 w/ 6” Rolls. Boschert type LB12 8 5/8” x 8 5/8” Power Corner Notcher s/n 3072 w/ Fence System. 1996 Ercolina “Super Bender” Power Tube Bender s/n 4960439 w/ ½”-2” Dies. Scotchman mdl. 4014C 40 Ton Ironworker s/n OC3168M388 w/ 14” Shear, 5” x 5” Corner Notcher, 8” Brake, Punch, 2” x 2” Angle Shear, Coping Attachment, Custom Tooling. Central Hydraulics 12 Ton Hydraulic Tube Bender. TA Shing Crown 2/1000 17 ½” x 42” Geared Head Gap Bed Lathe s/n C20012 w/ 32-2000 RPM, Inch/mm Threading, Tailstock, Steady Rest, KDK Tool Post, 10” 3-Jaw Chuck. Supermax mdl. YC-1 ½ VS Vertical Mill s/n 118537 w/3Hp Motor, 60-4200 Dial RPM, Chrome Ways, Power Feed, 9” x 42” Table. Crown mdl. NS-1 ½ VA Vertical Mill s/n 7212095 w/ 2Hp Motor, 90-5720 RPM, 16-Speeds, 9” x 42” Table. Shop-Smith Mark VII Lathe/Saw/Drill s/n 408074. HEM mdl. H90A-B/F 9” Automatic Hydraulic Horizontal Band Saw s/n 547697 w/ HEM Controls, Auto Feeds, Coolant. Scotchman 10” Miter Cold Saw w/ 2-Speeds, Pneumatic Clamping. Blue-Point Vertical Air Compressor w/ 60 Gallon Tank. Burr King mdl. 960 2 ½” Pedestal Belt Sander. Rexon 4-Speed Pedestal Drill Press. Mercuri 18” Abrasive Cutoff Saw. 6” Belt / 12” Disc Sander. Miller Millermatic 250 Arc Welding Power Source and Wire Feeder w/ Spool Gun Controller. Miller Syncrowave 250 CCAC/DC Welding Power Source s/n KG112869. Miller Millermatic 35 CP-DC Arc Welding Power Source and Wire Feeder s/n HK299051. A.O.Smith mdl. A-300L Arc Welding Power Source s/n 033-6102-11. Lincoln Idealarc SP-255 CV-DC Arc Welding Power Source and Wire Feeder s/n U1960513589. Airco Aircomatic PIP-PAK 200 Arc Welding Power Source and Wire Feeder. Miller Thunderbolt 225V Arc Welding Power Source. Proweld Stud Welder w/ Acces. Welding Gages, Hoses, Cords and Torches. Crary Bear Cat mdl. 72825 Gas Powered Towable Chipper / Shredder s/n 23058 w/ Rebuilt VH4D 4-Cylinder Engine, 7” Chipping Head, Electric Start. Troy-Bilt 10Hp Gas Powered Chipper/Shredder w/ Electric Start. Felker Dresser 14” Gas Powered Concrete Saw. Husqvarna mdl. X150 Gas Powered Concrete Saw. Porter Cable Production Pocket Cutter. Coleman “Pulse 1750” Gas Powered Generator. Metro Rooter Power Drain Snake. Delta 10” Power Miter Saw. Senco Pneumatic Framing and Finishing Nailers. Porter Cable and Makita Routers. Chicago Industrial Electric Jack Hammer. Stihl mdl. TS510AV Gas Powered Abrasive Saw. Chicago Electric Fiber-Optic Pipe and Wall Inspection Camera. Tempo mdl. 501 Tracker II Cable Locating System. Airlesco 5Hp Gas Powered Pressure Washer. Hilti DX460-F8 and SID144-A Hail Shooters. DeWalt Screw Shooters and Drywall Guns. Porter Cable Belt and Pad Sanders. SprayTech ED655 Airless Paint Sprayer. CAPspray Aircoat Portable Airless Finishing Sprayer. David White Meridian L6-20 Transit. (2) Yamaha Wave Runners VIN#’s YAMA0928H1192, TAMO71131889 w/ Trailer. 1985 Honda Odyssey 350 Quad Runner Gerber FasTrak 1300 Vinyl Cutter.